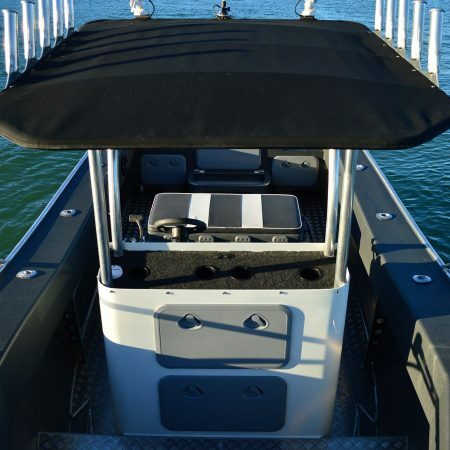 FC Boats | Centre Console range is designed and built for maximum space. FC 635 Centre Console (cc) is the reason serious fisherman use centre consoles. They “simply have more fishability”. The FC 635cc has broken new boundaries of fishability. Having a passion for fishing we have designed a boat with smooth ride, stability at rest and unparalleled dryness while underway. When you combine these attributes into one well thought out package you get a boat that can fish up to six while still having enough room to move, fight fish, and store loads of gear. All FC Boats are designed with our FC extended Gunnels which turn any side spray down keeping you and your crew dryer in all conditions. Those same wide Gunnels are foam filled for extra buoyancy right where it’s needed. The FC635 has 6 Welded in rod holders down each side so you never run out of space for you and your mate’s rods. FC underfloor Fuel, FC Ballast and stability tank as well as a huge FC passive live bait tank system adds up to 740 kgs of weight in the lowest most central part of the hull giving amazing stability at rest and the smoothest of rides while under way. The FC 635cc will offer you a fishing machine that will be capable of targeting any species you are chasing.